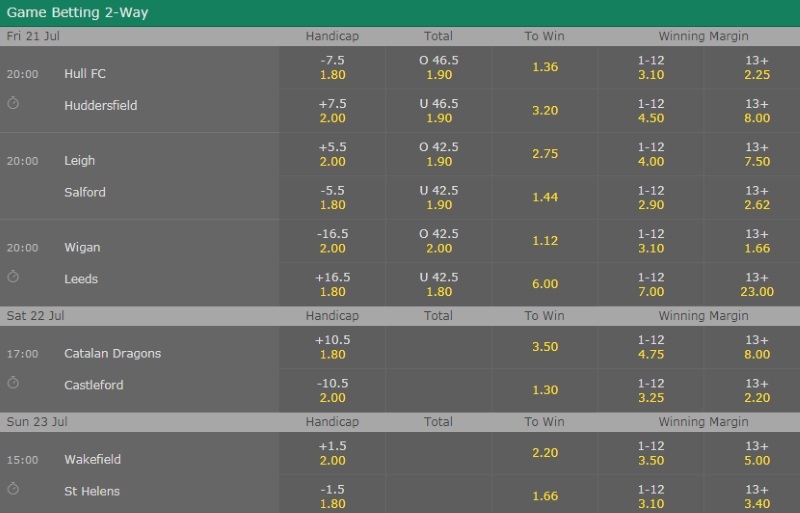 @harry_rag, you decided not to place any bets on the Super League action last weekend but is there anything this week that takes your fancy? Will be no bets from me more weeks than not as I'm either not betting on League or it's too last minute to post. Currently taking it relatively easy pending the start of the new domestic season (in England; I appreciate Scotland is underway already). Will post if I have a worthwhile bet and time allows but, as I say, that will be the exception rather than the rule. Have had bets on each of Jones-Bishop and Caton-Brown anytime tryscorers for Wakefield v St Helens in the game about to kick off. 6/5 Skybet and 5/4 Lads respectively. Both maybe value at shade over evens, quite confident that at least one of them scores a try today.